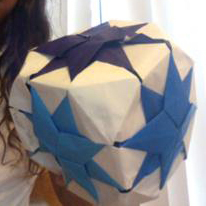 I made this origami in gifted Ed earlier this year. It was designed for the the 5th graders because this may be too complicated for 4th Graders. My figure is closed and has 8 pointed stars. There are 6 different side, which its own color of star. Mine wasn't the best but I had fun making it. Please Enjoy!